The Mars Helicopter is a technology demonstration mission. That means that the overall success of the Mars 2020 Rover mission that it’s a part of won’t hinge on the success of the Helicopter. It’s tagging along so that NASA can learn how to design, build, and use aircraft on Mars. There are huge challenges to flying on Mars. The power source can’t be combustion (unless it uses hydrazine) because there’s no oxygen. The atmosphere is so thin you’d need enormous wings, which is problematic for the trip to Mars. And any aircraft would have to be autonomous, because you can’t control it remotely from here on Earth. But there’s a ton of benefits to getting an aircraft to work on Mars. It could be used to scope out a landing area for other missions, with much greater precision than any orbiter. It could explore raised features, fly into lava pipes, and basically extend the scientific reach of any rover or lander mission it was a part of. That’s why NASA keeps working on it. 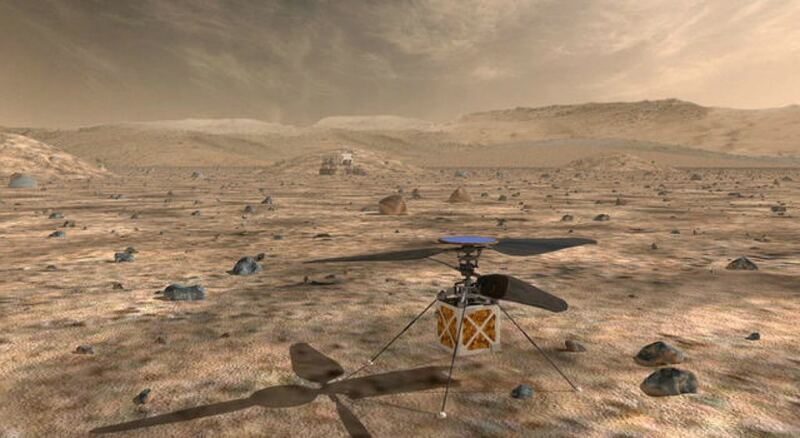 The Mars Helicopter gets around the problems of flying on Mars with clever engineering. It’s solar powered, and it uses its own tiny panels to recharge its battery. It uses contra-rotating rotors to keep its space requirements down during travel to Mars. Contra-rotating rotors are necessary because with a single rotor, the fuselage will rotate the opposite way. That’s why most helicopters have tail rotors. It’s also autonomous. It will take short flights away from the rover, only 90 seconds each. MiMi Aung, Mars Helicopter Project Manager. The testing is focused on how the helo can operate on Mars. NASA used their Space Simulator, a big vacuum chamber at the Jet Propulsion Laboratory. The Simulator can mimic the thin atmosphere and the low temperature at Mars. The simulator can’t mimic the low gravity of Mars, though. To do that, engineers devised a gravity off-load system. It’s a lanyard that attaches to the top of the Helicopter and tugs on it. The uninterrupted tug provides enough lift to simulate the weaker Martian gravity. This could be the start of something big for Martian exploration. These airborne vehicles can’t carry much of a payload so they’ll never replace rovers and landers. But as a part of a rover’s mission, they could add a lot. They could be the eyes for a rover, helping drivers choose the best route around obstacles. They can explore areas that are totally inaccessible to rovers. They could serve as scouts, finding the best spots to collect samples or to drill. They could also provide us with some great Martian eye candy, something we’ve come to expect from every NASA mission.